All streaks must come to an end, I suppose. I’ve long-since touted that Kirby has secretly been the most reliable video game character. Sure, he may not have ever reach the highest highs of Mario or Zelda, but he also never had any flat-out stinkers like the Mario edutainment games or the Zelda Cdi titles, either. Kirby Battle Royale may not be nearly as flawed as those ghastly games, but it is the first time I can think of where I wouldn’t recommend a game starring Kirby. So while Kirby’s reliability of never starring in an all-out stinker may be intact, his streak of having his name be attached to recommendable games has finally been broken. On paper, Kirby Battle Royale sounds like a decent concept, It’s a Kirby brawler. With Kirby’s history in the Super Smash Bros. series, it seems like it would make for a welcoming transition. Problems soon arise, however, when it becomes apparent that KBR doesn’t boast anything near the depth of Super Smash Bros., nor does it have enough variety in the gameplay to make up for it. Long story short, players can take control of their own Kirby, and select a specific copy ability when going into battle. 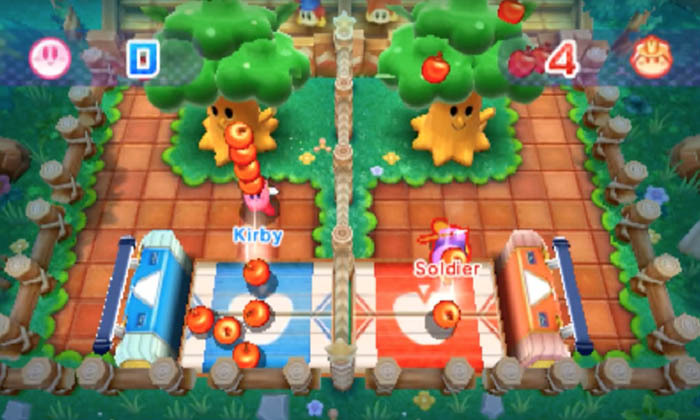 There are death matches that seem to make the most sense with the concept of Kirbys with different abilities battling each other, but things already fall short in this area, as the copy abilities only have their basic moves, lacking in the varied movesets that have been a part of the series since Kirby Super Star. If ever there were a time where it made the most sense for Kirby’s abilities to boast different moves and combos, you’d think it’d be in a multiplayer brawler. Yet this is one of the few Kirby titles of recent years in which that element is absent. There are other modes as well: Apple Scramble sees two teams working together to gather the most apples. Coin Clash is a contest to see who can claim the most coins, all while avoiding a coin-stealing ghost. Flag Ball has players attempting to throw a ball to their team’s flag, with the rub being that the flag can also be picked up, which makes things more difficult if the enemy team gets crafty. Overall, there are ten different game modes. While that may sound like a lot, and some of them (like Flag Ball) can be fun, they all end up being more in line with mini-games than they do full-on gameplay modes. So what you have feels like Mario Party without the board game segment and only 10 mini-games which, as you can imagine, can only hold your attention for so long. There is a story mode in the game, which sees Kirby and Bandana Waddle Dee (I still can’t believe that’s the character’s actual name) competing in the “Cake Royale,” a tournament that sees the heroic duo taking on King Dedede’s army of Kirby clones in order to win the ultimate cake. I have to say, I love that the Kirby series can be about saving the universe in one game, and then be about winning a cake the next. What other series has such drastic shifts in the seriousness of its plots? In the story mode, players start out in the Beginners’ League, and work their way through the Bronze, Silver, Gold and Platinum Leagues. Each stage is comprised of the ten aforementioned games, but in a nice twist, not every stage in a league has to be completed, only as many as it takes to earn enough points to move on in the tournament (though you are free to do them all, if you so desire). The more points you get, the more copy abilities you unlock in the story mode. 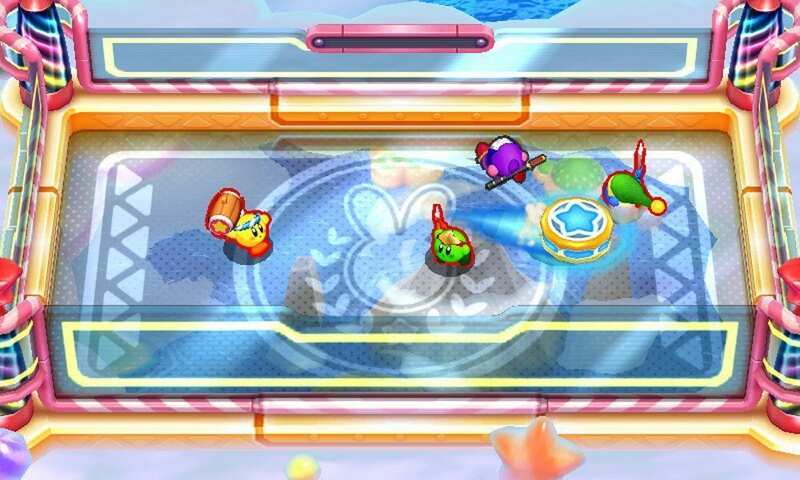 Though the game’s top-down perspective can make certain abilities harder to use than they should be (shooting fire and ice from Kirby’s mouth isn’t so accurate as it is in a 2D plain). Additionally, once you reach the Platinum League, you can equip special orbs before a match that can be used in-game to temporarily boost your abilities. The orbs are an interesting concept, but they end up being too little, too late, given that they only appear in the story mode’s final act. The basic gameplay of Kirby Battle Royale can be fun, the problem is that it seems to settle on its bare assets far too often. The entire game feels more like it could have simply been a bonus mode in one of Kirby’s meatier (and far superior) 3DS outings like Kirby Triple Deluxe or Kirby Planet Robot. I suppose if you have enough friends who are interested, you can have some fun play sessions with Kirby Battle Royale. The graphics are also nice and the music is – per the norm for Kirby – memorable and catchy. But for the first time ever, Kirby feels like he’s grown complacent. A Kirby brawler sounds like it could be a roaring good time, but in its execution, Kirby Battle Royale constantly feels like it could be more. 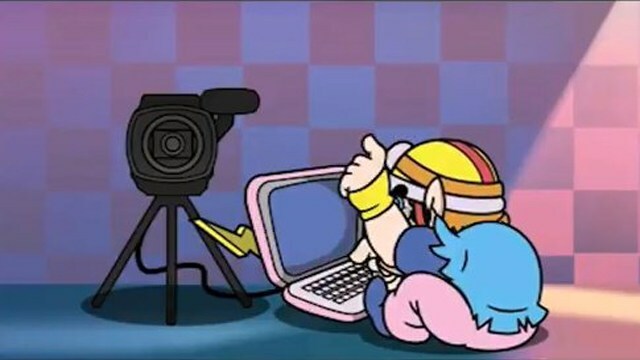 Is there any series – whether in the arsenal of Nintendo or any other developer – that better showcases the joys of video games in their purest form than WarioWare? Wario’s bizarre collection of ‘micro-games’ strips the medium to its most bare bones state: Push the A button. Go right. Duck, jump, tap the touch screen. WarioWare deconstructs and parodies the very idea of video games through sheer simplicity, but also providing a great time while doing so. WarioWare Gold serves as something of a greatest hits of the irreverent series, showcasing micro-games from past entries as well as a host of its own; featuring traditional button presses, touch controls and motion controls to create the biggest WarioWare yet. Possibly even the best. After the well-meaning but misguided Game & Wario on Wii U, WarioWare Gold is back to basics. Players face a succession of seconds long micro-games, each one asking the player little more than a button press or two. 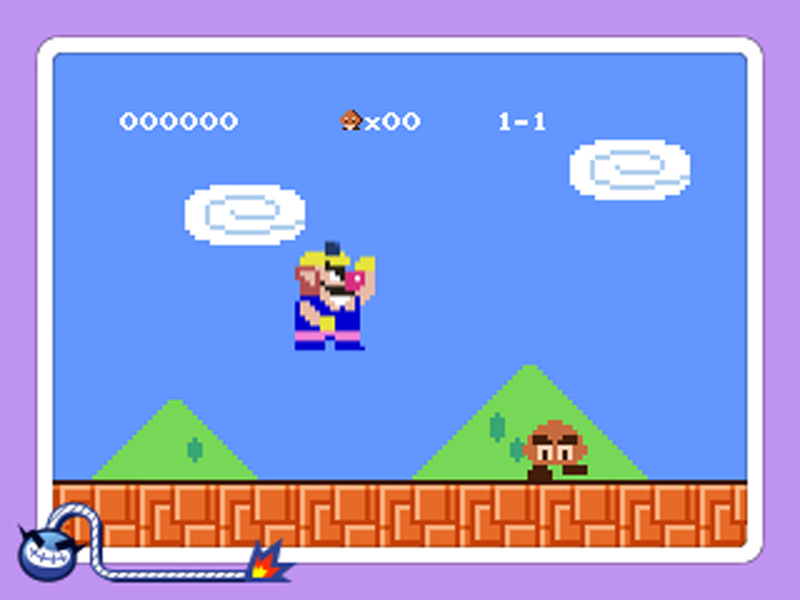 But the more micro-games the player completes, the faster they get, until everything turns into a jubilant chaos worthy of Wario’s maniacal laughter. WarioWare Gold features three different primary modes of play: Mash games simply require the use of the D-Pad and A button (y’know, button mashing). Twist style games – named after the Game Boy Advance’s brilliant WarioWare Twisted – see players rotating their 3DS console in a myriad of ways to accomplish them through motion controls. Finally, Touch based games use the 3DS’s touchscreen. The games are wonderfully silly, with my personal favorites being the Twist-style of games. These micro-games can be unlocked by playing through the story mode (a loose term here, as there isn’t much story, but it should provide some good laughs). The story mode sees the absurd cast of WarioWare each introduce a different theme of games within the different playstyles, with players needing to beat a ‘boss game’ within a character’s series of games to move on to the next chapter within a particular play style. Once the boss round is completed, players can replay the chapter and try to shoot for a high score, with four failed games leading to a game over (though extra lives can be earned by defeating the boss rounds). After a micro-game is played, you unlock it in the other game modes. These modes include the Index, where you can play any micro-game you want repeatedly to get a high score on a specific game; meanwhile, Challenge Mode is unlocked once the story is completed, and bring changes to the micro-game marathons (such as randomly switching between the three play styles of micro-games, which is sure to keep players on their toes). You can even compete against another player online to see who can outlast the other as the micro-games get faster and faster. WarioWare Gold features a strong presentation, with the usual , purposefully cheap animation making a return, albeit looking crisper and cleaner than ever. Notably, this is the first entry of the series to feature full voice acting, which makes the story mode all the funnier. And of course, the micro-games feature a dizzying variety of art styles which range from Nintendo throwbacks to anime to stock photos and scribbles. Many of the micro-games will leave a goofy grin on your face through the art alone. WarioWare Gold may not reinvent the series formula, but this isn’t exactly a series aiming to revolutionize. What WarioWare Gold does achieve is providing the closest thing to a definitive entry in the series yet. It takes bits and pieces of its predecessors and tosses them into a blender. WarioWare Gold’s rapid-fire micro-games and different play styles make for an ideal on-the-go gaming experience. Once upon a time, the convenience of being able to take a game on the go also meant sacrificing much of its quality. Sure, there were some exceptions – with Link’s Awakening and the early Pokemon titles being early examples of well-regarded handheld titles – but it would be hard to argue that the Gameboy boasted the same quality or timeless appeal as the SNES games that were being released at the same time. The early 2000s saw handheld gaming take major steps towards sharing the same level of quality as their console counterparts. More recent years have really brought handheld gaming to another level. Now, with the Nintendo Switch combining a handheld with a home console, the line between the two is more blurred than ever. On the downside, that also means that traditional handhelds as we know them are becoming a thing of the past. It’s even hard to imagine Nintendo giving the 3DS a successor when they can do more on the Switch anyway. As such, I think naming the best handheld title of the upcoming years may be a different beast than it’s been in the past (considering handheld games are now quite literally the same as home console titles). If I choose to continue this category in the future, it may seem like a superfluous additional token to a Switch game or the like. Because of that, I’ve decided to omit Switch games from this category for 2017 (because how could Super Mario Odyssey or Breath of the Wild not win?). Think of it to give a “last hoorah” of sorts to handheld gaming as we once knew it. I have a complicated history with Pokemon. As much as I love the overall idea of the games (and their many wonderful creatures), I’ve often felt it’s the most unchanging of Nintendo’s major franchises (which is particularly ironic, given its emphasis on evolving creatures). For every Pokemon I’ve got to level 100, I have a game unfinished. Thankfully, the 3DS entries have been heading the series in the proper direction. Finally shedding their 2D skins for 3D graphics, the X and Y versions felt like they brought the series more up-to-date, while Sun and Moon felt like a rightful step forward. They may not have reinvented the formula, but they added some much needed alterations to it. 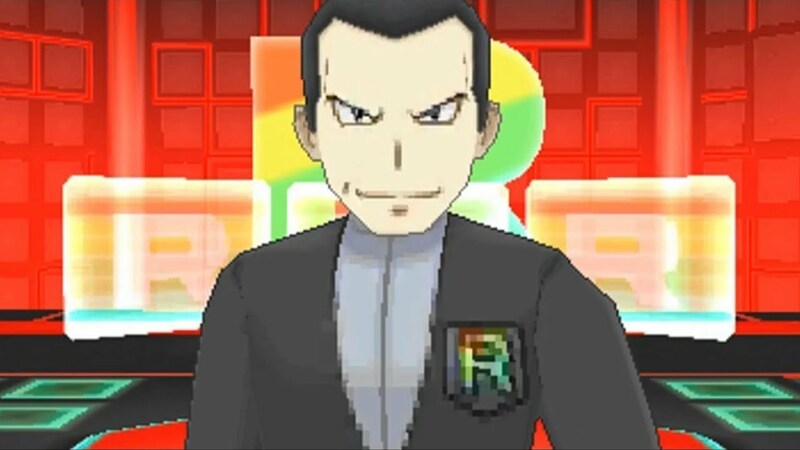 Ultra Sun and Ultra Moon (the “Yellow versions” to Sun and Moon’s “Red and Blue) continue this trend, bulking up what its preceding versions built while also adding in some tweaks of its own (including a weird story involving alternate dimensions and the long-overdue return of Giovanni and Team Rocket, who will hopefully be back in Pokemon Switch seeing as all subsequent Pokemon baddies felt like their bargain bin equivalent). The new “Ultra” versions of Sun and Moon allow you to obtain almost every legendary Pokemon from the series’ history, which feels like a great way to pay homage to the series’ heritage. While aspects such as those may play up the nostalgia card, Ultra Sun and Ultra Moon also bring about enough of their own changes to the established formula to ensure that the future continues to look bright for Pokemon. Metroid: Samus Returns serves two primary purposes: the first is to remake Metroid II: Return of Samus, originally released on the Nintendo Gameboy in 1991, and bring it up-to-date for a modern age. The second, and more important purpose, is to bring Metroid back on track, after the last decade has soiled the series’ once nearly-flawless track record. After Metroid: Other M delivered an all-time stinker on Nintendo’s part, the series laid dormant for a few years before the mediocre Metroid Prime: Federation Force polarized fans. While Metroid: Samus Returns is definitely a step in the right direction to get the series back to its former glory, its far from the franchise revival the series really needs at this point. 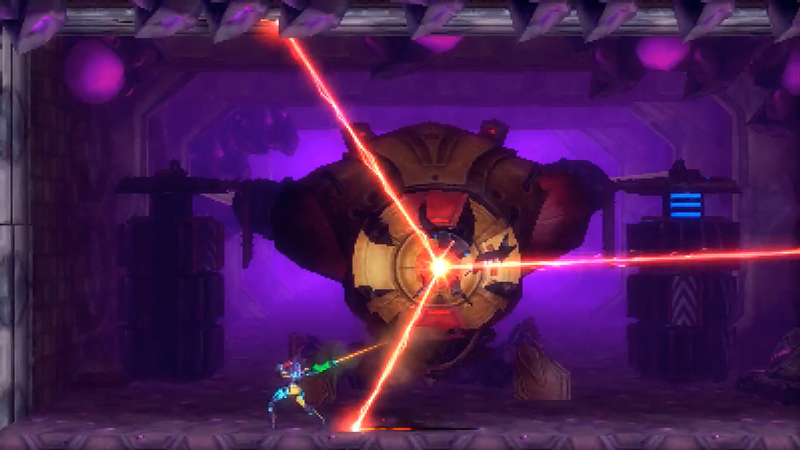 On the plus side to things, Samus Returns resurrects the 2D, sidescrolling ‘Metroidvania’ gameplay that the series pioneered, which is definitely a return to form as far as structure is concerned. Improvements have been made to the outdated Gameboy title, however, as Samus can now fire her weapons in any direction, and many features that didn’t arrive in the series until well after Metroid II’s original release (such as the Super Missiles and Grapple Beams) are now part of Samus’ arsenal. Additionally, Samus now has a melee counterattack she can use on enemies for critical damage, which is a nice – if maybe a bit overused – addition to the gameplay. To add a touch of RPG mechanics into the mix, Samus can now also learn “Aeion abilities,” which are performed with the usage of an energy gauge, akin to the magic points of an RPG. These are all fine additions to the game – as are the new 3D visuals and updated music – but at the same time, they only elevate the experience so far, as Samus herself doesn’t seem all that fun to control this time around. That’s not to say that the controls are bad per se, but Samus seems to move stiffer than she did in Super Metroid way back in 1994, and the flow of the game ultimately stumbles because of it. 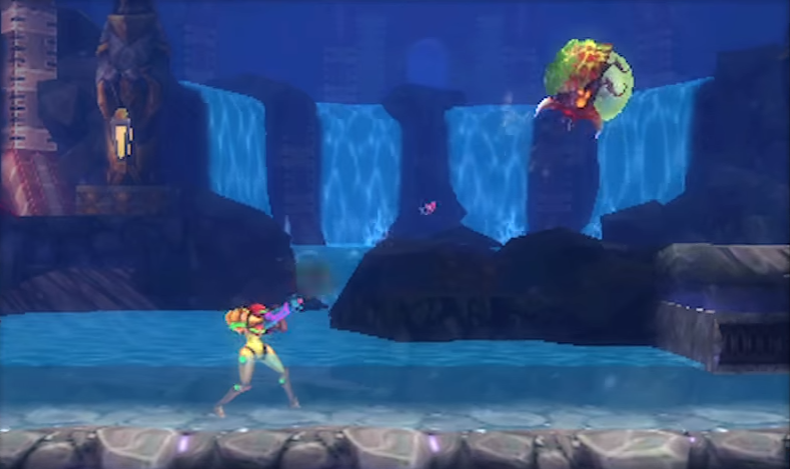 The setting of the game – the Metroids’ homeworld of SR388, also doesn’t make for very captivating level design. Metroidvania titles are at their best when they have you return to previously-explored areas with new abilities, thus being able to uncover all new paths that you couldn’t during your initial visit. But Samus Returns seems to lack that sense of surprise and discovery. With Samus’ progression being dictated by exterminating the Metroids that appear on her radar, the experience feels hallowed out to simply being about going from one point to another to shoot something. Samus Returns lacks the ‘eureka moments’ of the genre’s more refined titles like Super Metroid or Castlevania: Symphony of the Night. If you’re a diehard Metroid fan who has felt that Nintendo has left the series out to die in recent years, Samus Returns may serve up enough classic Metroid goodness to help ease the pain of Other M and Federation Force. But it also lacks the sense of depth and engagement that the series is known for with its best entries. It’s one small step for Samus, but we’re still waiting for that next giant leap for Metroid-kind. It isn’t all too often that you get to play a game that feels distinctly different, but that’s pretty much the case with Culdcept Revolt, which plays like a combination between a board game and a card game, with some light RPG elements thrown in for good measure. Although it boasts a somewhat tedious nature that will turn away some players, those who will fall in its niche will likely be hooked. Truth be told, this isn’t the first Culdcept game, as the series saw some releases on the PS2 and Xbox 360 back in the day. But Revolt is the first entry in the series to make its way outside of Japan for nearly a decade, so even those who did manage to play the series during its “test run” era in the western world will likely feel a sense of newness when stepping into Culdcept Revolt’s unique setup. 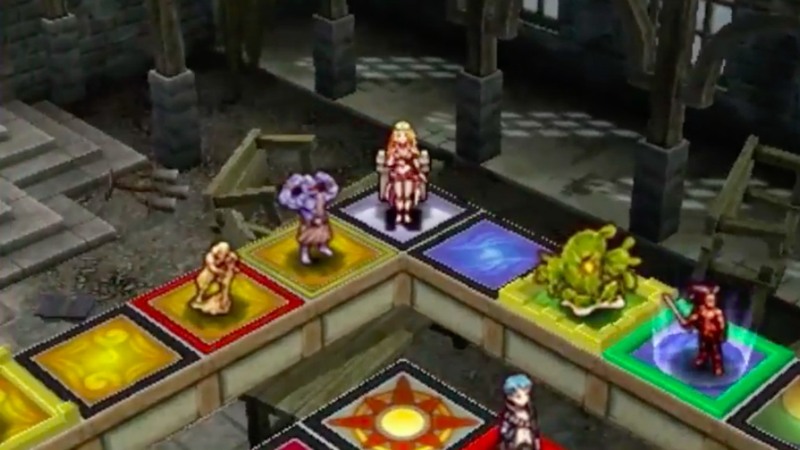 The goal of Culdcept Revolt is to acquire a certain amount of magic (which varies depending on the board) and then make a lap around the game board while still holding on to the required amount of magic. As you may have guessed, you try to either prevent your opponent from gaining enough magic to win, or steal it from them when and if possible. It works something like this: the game boards are comprised of five different types of spaces; fire (red), water (blue), wind (green) and earth (yellow) make up the majority of the boards, with the “gate” spaces being required to pass by in order to complete the aforementioned laps around the board. At the start of each turn, the players are given a card; either monster, item or spell. The monsters are possibly the most important, and are placed on spaces to steal magic from the opposing players who happen to land on that same space. Either the enemy player pays the toll, or they attempt to battle the monster with one of their own. Should the defending player win the battle, the passerby must still pay the toll. But if the offender wins, they get to keep their magic. Most monsters come in one of four types, corresponding with the elements of the board spaces, and receive bonuses if they’re placed on a space that shares their element; but there are also monsters that don’t have types, and are best used when you’re not in a position to gain the bonuses. Should you enter a battle with a monster, both parties have the ability to equip their monster with an an item card (when applicable), which may increase their hit points or strength, or provide a different bonus, like a guaranteed first strike. Finally, the spell cards are used outside of battle, and can be used to get a head start in a fight by damaging a monster, or provide you with extra magic, or even limit the number a player’s dice will land on in the next turn (which can potentially be used to help yourself or hinder an enemy). Players gain additional magic every time they pass a gate space during a lap, and once they finish a lap, the monsters they placed on the board lose their “fatigue,” which essentially means you can then provide them with additional bonuses. These bonuses mainly revolve around altering your conquered terrain. You can change the color of a space, swap the positions of monsters, and even increase the value of a space, thus increasing the toll enemy players need to pay. The catch with all this is that playing most of your cards, and performing these territory actions, cost you some magic. So you can’t simply upgrade your territory and deploy monsters all willy nilly. There’s a sense of strategy to be had. In terms of the core concepts, Culdcept Revolt has a lot of originality going for it. It feels like something like a crossover between Monopoly and the “Duel Mode” of Mario Party 3, but with fantasy monsters and anime characters. 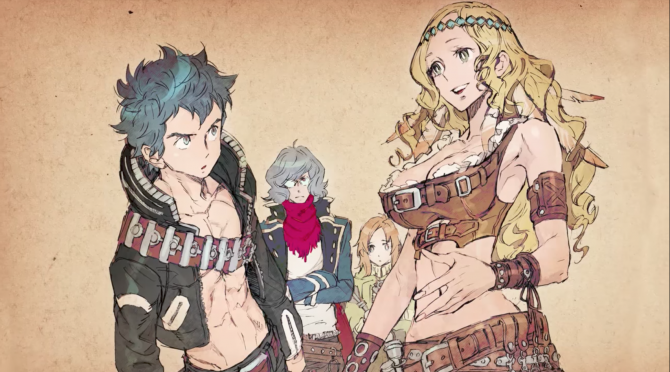 Despite the freshness and charm, however, I’m afraid that Culdcept Revolt won’t be a game for everyone. Many of its matches will feel like they drag on and on. This is doubly true in the single player campaign, in which the enemy AI seems to take its sweet time in making decisions, and the characters often feel the need to bombard the player with dialogue at the start of their every turn. And frankly, the things the characters have to say aren’t particularly interesting, with a storyline that’s riddled in cliches, right down to the whole “main character with amnesia” trope that seems to follow anime-styled games like cuteness on a puppy. Another downside comes in the form of the random elements of the game itself. Okay, so like any game where dice is a factor, there’s going to be a bit of randomness about it. But Culdcept Revolt feels like one of those games where computer players conveniently get consistently high rolls, while the human players are outright lucky if they manage to move more than two or three spaces in a turn. Not to mention that the cards you receive at the beginning of your turn are also completely random, which makes it hard to build a proper strategy from the outset. Sure, one could argue that the random cards are akin to an actual board game, but real board games usually provide you with different decks to choose from. At the very least, being able to pick whether you draw a monster, item or spell would help add to the strategizing. Culdcept Revolt is a game that certainly showcases some fun and original ideas, and even includes the ability to save in the middle of a match to return to it later, which is perfect for a portable game given how lengthy the match-ups can be. But Revolt also isn’t a game for everyone, with its single player campaign teetering on the boring side. Thankfully, local and online multiplayer should have you and another player enjoying the game for what it is. If you have the patience for it, that is. Bit Dungeon Plus looks to bring some old school challenge to the Nintendo 3DS, and while the concept does deliver on that to a degree, it ultimately suffers from a lack of polish and (in my case anyway) some notable technical issues. Bit Dungeon Plus has an obvious inspiration in The Legend of Zelda: A Link to the Past. It uses the same top-down perspective, and even utilizes 16-bit graphics. Players take control of a knight, who can obtain new weapons, armor and magic spells along their journey. After a set number of enemies are defeated, they can even gain levels like in an RPG. Upon gaining a level, players can choose to upgrade their maximum health, their attack power, or the strength of their critical strikes. Players can find health and magic restoring formulas by defeating certain enemies and breaking objects. Additionally, you can buy special upgrades and items by finding secret shops hidden inside of dungeons. All of the action in the game takes place in these dungeons, which are randomly generated. What enemies and items you find in the dungeons will be different in every playthrough, and once you defeat a dungeon’s boss, you can move on to a more difficult dungeon. Here’s the part of Bit Dungeon Plus that I found refreshing and original: when you die, you have to start all over, losing any levels you gained and increased stats you’ve acquired. However, any of the weapons and armor you’ve found can be equipped on your starting character in the next run through. So in each playthrough, you’re likely to find better weapons and armor to help you the next time around. The core concept behind Bit Dungeon Plus is fun and may have you intrigued to keep playing for a while. Unfortunately, the game has some glaring rough edges. For starters, close-range enemies are essentially a non-threat, as they move incredibly slowly (if they move at all), and never seem to attack. If a ranged enemy attacks with a fireball or arrow, you can easily defend from the damage by holding up your shield. But with the melee enemies, you basically don’t have to worry about taking damage. Just walk close enough and swing away. There also could have been a bit more balance with the character progression. After increasing my attack power just a few times, I was able to take down bosses with three or four presses of the A button. As fun as the general idea behind the game is, the difficulty curve seems almost untested, as you can become close to unstoppable all-too soon. In fact, when I did become this powerful, my play session only ended because the game crashed. In fact, Bit Dungeon Plus crashed on me on two different occasions! And I should add that I have never had a 3DS game crash on me in the past. I also experienced some graphical errors and freeze-ups during the game. The core gameplay of Bit Dungeon Plus is fun, but the lack of polish and technical issues really detract from the experience. 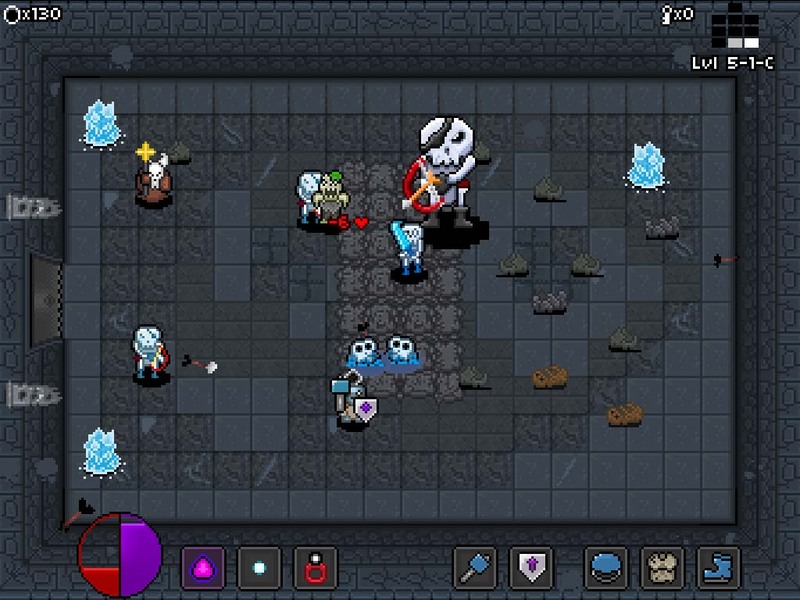 Bit Dungeon Plus is a well-intentioned, retro experience, but it definitely could have used some extra development time to work out the kinks. The RPG Maker series has had an interesting history. Though it began in the mid-1990s as something of a game-creation game, the series later became a more overt tool for game creation. Though RPG Maker isn’t the most complex program for game-creation, it has lead to a few critically-acclaimed commercial releases, such as To the Moon. Though RPG Maker Fes’ status as a 3DS title brings the franchise back to its more humble roots and limitations, it still brings a decently robust set of tools for hopeful game designers to practice their skills. As stated, being a Nintendo 3DS title, RPG Maker Fes is a lot simpler than its PC/Mac supported contemporaries, but that also means it’s relatively more accessible. 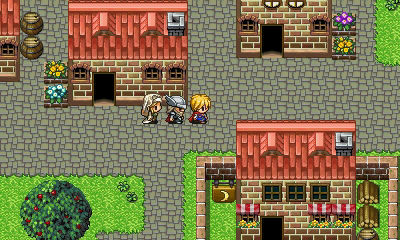 RPG Maker Fes, as the franchise-name implies, allows you to create your own RPG titles. The game is grounded in a 16-bit aesthetic, but that’s fine by me, seeing as that generation was the genre’s heyday. Visuals aside, you might even be surprised by how much you’re able to do and make on a tiny 3DS cartridge. You can create characters, character classes, items, weapons, spells and enemy monsters. You can set their graphics, sprites, statistics. You can build the world map and dungeons via the touchscreen, and create story events and write dialogue. You have pretty much the essentials at your disposal. Perhaps not enough to make the RPG of your dreams, but certainly enough to make a fun, short RPG that can give you a better understanding of how to get started on the RPG of your dreams. As someone who hopes to one day make video games, RPG Maker Fes serves as a nice introductory tool. Of course, there is a notable caveat in that there are no tutorials or instructions to really tell you how to get started. Now, most game making programs don’t have such things, but seeing as this is a pick-up-and-play, 3DS entry, you kind of wish there could be a few adjustments made to ease players in. The biggest downside to RPG Maker Fes, however, are the unfortunate limitations that come with the hardware. As mentioned, RPG Maker has always been more simple than programs like GameMaker or Unity – with set visual and audio aesthetics for starters – but if you were clever enough with it, you could make something that was more your own than the program initially suggests. People have often made their own sprites, imported their own music, and even tampered with the RPG gameplay. Don’t expect that same level of freedom here. Your stuck with whatever graphics, sprites and music the game displays for you, and though you may find some clever ways to change up the designated gameplay, I don’t think Fes is capable of the same kind of liberation of other RPG Maker programs. This is all the more of a downside when you realize just how limited things like the graphics, music and sprites are. The game is limited to a rather generic anime art style, and the packaged game only comes with the typical fantasy settings and materials to work with. Other themes are planned for DLC releases, but it feels kind of cheap to not have more variety from the get-go (strangely, some graphics for guns and don’t-call-them-lightsabers exist, despite the fantasy-themed limitation. That could add some creative fuel to the fire, but it would also be nice to place swords and sorcery in a futuristic sci-fi setting and the like). Further problems will arise with the limited number of graphics you have to work with for characters, monsters, weapons and items. Each category only has a handful of sprites and objects to work with, which you might find yourself exhausting pretty quickly when creating your game’s assets. Each sprite and graphic features four different colors, but such simple palette-swapping is a pretty iffy means to add variety. With all of these complaints and limitations said, RPG Maker Fes is still surprisingly deep with what it allows you to do with its tools. After all, a good story and fun dialogue can make even the most basic sprite liven up, and good world design and gameplay can make up for a predictable setting. If the player is inventive enough, and has the patience for it, they can make an engaging (albeit short) RPG, and hopefully develop a wider understanding of game design. Better still, you can share your creations with others, and download the creations of others in return. Meaning that – good or bad – you can experience what other players have dedicated their time to making, and they can experience the same from you. It certainly has enough limitations to hold it back, but if you hope to one day make video games, RPG Maker Fes is a decent place to start. I’m still a long way off from releasing my first dream game, but after playing RPG Maker Fes, I do feel a step closer. If you give it a whirl, you could be too.